Dionisji School, Beginning of Sixteenth Century. Now in the Tret’jakov Gallery, Moscow. In the upper part of the icon a series of individual image represent the seven days of the week. The themes for the days are those long-established in the Russian Church. In the anonymous text of The School of Moscow (Milan: La Casa di Matriona, 1987) it is stated: “Saturday is represented by Christ in glory, surrounded by the Mother of God, St John the Baptist, and the archangels; all are enwrapped in white clothes, including the Precursor who has exchanged his garments of camelskin for a white cloak (School of Moscow, 26). The Sabbath is thus presented as the ultimate goal of human life, where all is fulfilled and transfigured. So it is that in the lower register of the icon ten niches contain group-icons of various orders of saints: male and female martyrs, patriarchs, prophets, ascetics, etc. All is gathered into the final Sabbath of Christ, a Sabbath, which, though implicit in the new creation of the resurrection (and baptism), is only fully realized or actualized when people have appropriated the grace proper to that life. The original icon measures 1100 × 910 mm. The image is available at Wikimedia Commons. A search for ‘Hexameron icon’ on the Wikimedia Commons site will also bring up other Hexameron icons. These icons are all much more recent than the icon featured here. 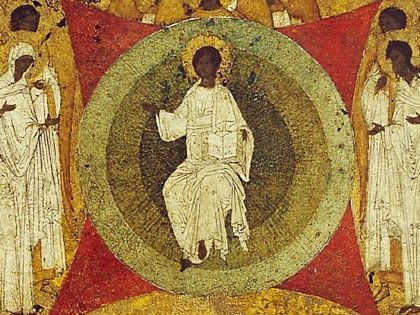 Artistically, they are far less impressive and theologically they are wayward, with the Father depicted as an old man, etc. More information on the history and provenance of the icon can be found at this link.